Just when we couldn't have enough of the leaked images of the Samsung Galaxy S6, more surface online. 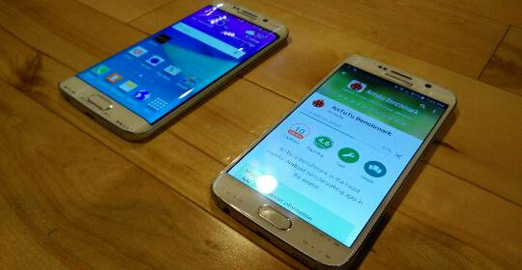 Samsung is set to launch the Galaxy S6 and Galaxy S6 Edge on Sunday, March 1. Two new leaked images show a better view of the both Galaxy S6 and S6 Edge to affirm the possibility that there might be no microSD card slot or a removable battery. Also, the image does show the slopes on both sides of the display on the Galaxy S6 Edge. Samsung has introduced a new design language with the new models. However, the new design does look like a mashup of Meizu MX4 and Xiaomi Mi Note along with the Apple iPhone 6 like metal frames. There's an IR Blaster and microphone on the top while the audio port is at the bottom next to a microUSB port and speaker pinholes. More details can be expected at the formal launch coming this Sunday. We will be covering the launch of Samsung Galaxy S6 launch live. Be sure to tune in to find out everything about the smartphone. You're both mis-reading & mis-understanding my reasoning. I don't see any benefit continuing attempted reasoned discussion with someone that resorts to theatrical accusations & overly dramatic conclusions. Good luck.